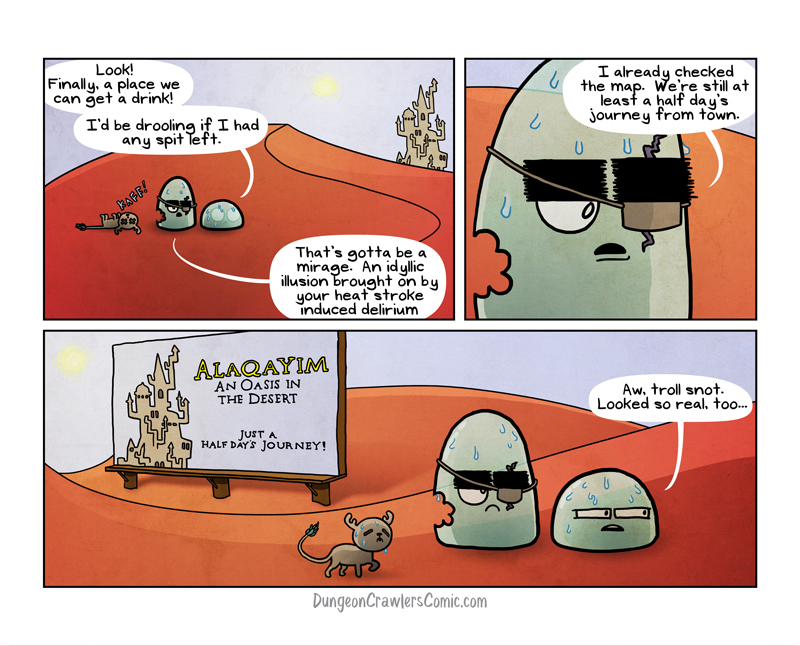 The boys are almost to Alaqayim, a desert city I created for one of my D&D campaigns. I try and pull as much as I can from my roleplaying experiences to really liven the comic up, so hopefully there will be more crossovers. I also wanted to say thank you to everyone who’s been commenting and wondering why there’s been no new content. I’ve been trying to update every other week, but kind of failing, even at that slow schedule. The reason behind the slower posting rate is that I am working on something special for the 100th comic coming up, (we’re on like 85 or 86 or something) and it is taking a whole mess of time and resources. Be patient and goodness will reward you. I’m just glad to see an update. Thanks!